Going Out on a LIMB for you! Welcome to Langley Tree Service and Arborist. We provide tree services such as topping, removal and pruning as well as hedge trimming, stump removal and stump grinding, spiral pruning as well as landscaping to properties throughout the Lower Mainland. As arborists and certified tree fallers, we know more than just trees! And with over 25 years in the business throughout the Lower Mainland, we are the best tree service company guaranteed! We proudly provide superior tree service to both residential and commercial clients. Looking for hardworking, honest and reliable workers. Preference given to those with ISA Certification. Tree pruning by a professional tree service company can help your trees look the best it can and keep them healthy. A tree’s natural form is best for most landscapes however, when trees are closely planted and situated together, you need to attain curb appeal by attend to your landscaping. Tree and hedge trimming or pruning is a simple solution for a beautiful looking garden. Hedge trimming can be done to fit your yard, your aesthetic and your budget. 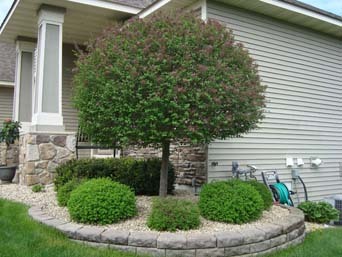 We are skilled at keeping shrubs and bushes tidy and trim. We also offer spiral pruning for a more unique landscape. Keep yourself, your family and your property safe. As a homeowner, your home and your property is a huge investment; an investment you would want to protect. Dead or dying branches pose a threat to your home and your family. Removal of dead branches removed is a good way to ensure that limbs aren't a hazard. A strong BC wind storm could loosen any dead or dying branches and possibly send them crashing into your house, your garage, your neighbors house or even your car. Let Langley Tree Services safely remove those dead branches from your property. Did you have a tree fall or branches broken? If so, contact us at 604-265-9413. Is this an emergency situation? We offer storm damage tree cleanup or tree removal on our 24 hour emergency line. Does your home or garage have many tree branches that overhang? Your gutters and roof can be protected when you get those overhanging branches professionally pruned by Langley Tree Service. We happily provide tree topping and tree trimming services to extending the longevity of your eaves and roof by simply managing and maintaining your tree pruning. Make your home or business look great and promote security buy keeping your surrounding shrubs and hedges pruned and trees trimmed. When there are hedges, shrubs or trees hiding entrance ways or windows, this becomes a great hiding place for a potential burglars. Routine yard maintenance such as trimming trees and pruning hedges increases visibility and security as well as contributes to your overall curb appeal. A win-win for sure! And for commercial properties, safety for your customers and tenants should be a concern! We provide our expertise regarding commercial tree services to property managers, strata, commercial business, construction professionals and real estate agents in Lower Mainland. Crowning and Spiral pruning is a good alternative to tree topping as it allows for wind to move through your tree rather than against it. This decorative landscaping technique can make for an elegant, unique yard and provide excellent curb appeal. An unhealthy tree can make for an unhealthy environment. Interested in having a tree removed from your property? Langley Tree Services provides complete tree removal services no matter how large or small the tree. We do tree removal limb by limb to ensure your home safety. We assure you that your surrounding property will not get damaged by providing tree felling. Tree felling is the act of cutting the tree so it can then fall on its own. Give us a call at 604-265-9413 and we will do an onsite arborist assessment to determine what is best for your particular tree removal. Does that tree absolutely needs to be removed? There are a variety of factors to consider when thinking about complete tree removal. Some reasons are fairly obvious and can be easily determined, like if perhaps the tree is dead (did it not sprout leaves in the springtime?) or could it be that it's diseased? If you are uncertain whether you need tree removal, our tree service experts will provide an assessment for free. Does the trunk have any damage? Is this species a desirable one? Does it have a hollow trunk? Are there several dead branches? Do the majority of dead branches reside on one side of the tree? The tree, is it leaning? Does it reside under power lines? Langley Tree Services will assess the tree and only recommend complete tree removal after all of the above factors have been taken into consideration. Check out our tree removal page for more information to determine if tree removal is the best choice for you. Also take into consideration any tree removal permits you may need for your particular city or municipality. 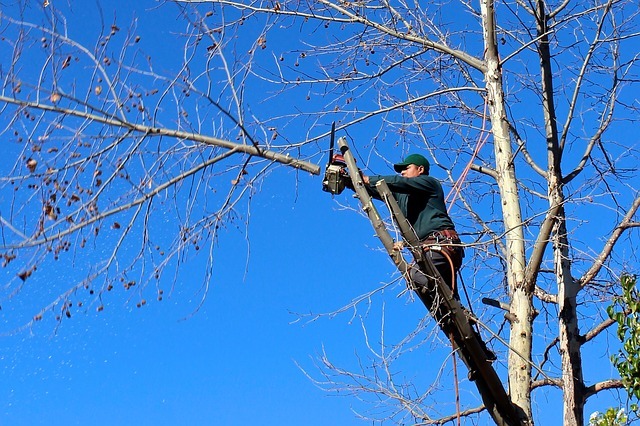 Other tree services include dangerous tree removal and tree chipping. Tree stump humps are not your yards best asset. Have you recently had tree removal done? Perhaps you decided, at the time, that the tree stump wasn't an issue but have since decided it is? Perhaps you’ve moved into a new house and your property has an unsightly stump in the yard. No matter the reason, Langley Tree Services has a simple solution: stump removal. 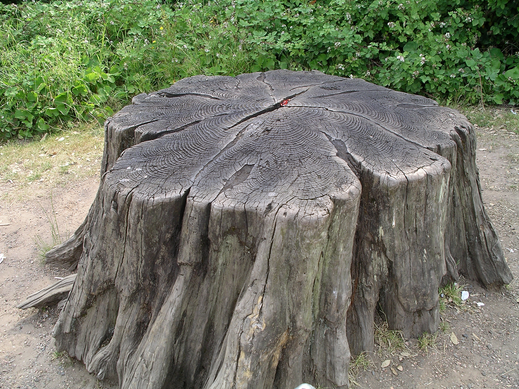 Remaining tree stumps can lead to future problems like suckering (which is when new shoots begin to sprout from the trunk and roots) or fungal root rot and tend to be a challenge when it comes to landscaping and mowing the lawn. It's best to leave stump removal and stump grinding to professional, local tree care company like Langley Tree Services. We offer safe stump removal services. Contact us at 604-265-9413 to learn more. Stump grinding or stump chipping is another way of dealing with that pesky stump. By using special equipment, we are able to grind the stump down to a desired level, typically a few inches or centimeters below ground level. Then, you'll be able to sod directly over the ground down stump. With stump grinding, you achieve a level surface which means there are less chances for injury such as tripping, which might be an issue when a stump is left behind. The stump grinding sawdust can then be utilized as garden and landscaping mulch. Ask Us About FREE Wood Chips! Dealing with serious tree issues due to a wind storm or accident? Call us for for 24 hour emergency tree service.